The last "closed door" student Yip Man took on was a young Leung Ting. Grandmaster Leung Ting would go on to found the International Wing Tsun Association. Under the IWTA's European Wing Tsun Organization, Alex Richter became a student of Grandmaster Keith Kernspecht at The Castle and later a private student of GM Leung Ting himself. Sifu Alex Richter then founded City Wing Tsun Athletic Association in NYC, where Jose Reyes would earn his title as first degree technician in the art of Wing Tsun and himself go on to found Western Lotus Athletics. A Southern Chinese boxing system, Wing Tsun or Wing Chun (詠春) is a lot more than just kicking and punching. Bringing together Power and Ease, Strength and Flexibility. Said to have hailed from the same ancestral martial art (Fujian White Crane) as Karate, and utilizing some of the same ideas as arts as Jiu Jitsu and Tai Chi. The Wing Tsun system focuses on superior angles and timing. Wing Tsun was traditionally passed from Master to a one or two chosen disciples until the propagation of the art throughout Hong Kong by Yip Man (Ip Man). In his escape of his native Foshan from communist China. Grandmaster Yip Man began taking students in his adjustment to city life. Most notably Bruce Lee, Yip Man also taught the several masters who have further propegated the system. Sometime during the Qing Dynasty a young beautiful woman by the name of Yim Wing Chun (嚴詠春) was engaged to marry. However, a military officer on a campaign of his entrusted territories spotted the young beauty and insisted she would become his bride. Already being engaged she protested his advance with results. Until the interference of the Shaolin Nun by the name of Ng Mui. Ng Mui promised the officer that Wing Chun would be his bride, if at the end of his campaign he would return and was able to defeat the young beauty in a fight. Full of confidence, the officer agreed to the terms. The Nun, recently escaping Siu Lam Temple in it's destruction, had witnessed a fight to the death between a Snake and a Crane. 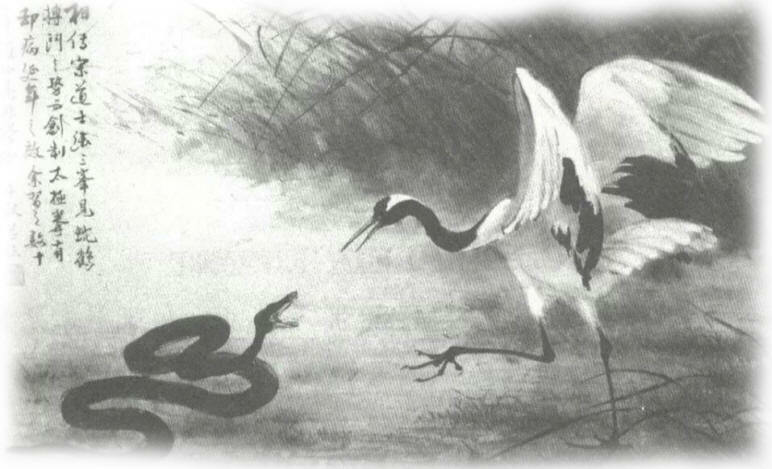 Utilizing what she had seen between the snake and crane and her prior Kung Fu practices, Ng Mui taught this newly formed system to the young woman. At the end of the officer campaign, the young Yim Wing Chun was easily able to defeat him. Even with his years of military training, Wing Chun was able to win, not by using brute strength and over baring power, but by using speed and superior angles. The same as witnessed of the snake and crane battle. The officer left in embarasemnt and Yim Wing Chun was left to marry Leung Bok-Chau.